This is our 1W&3W High Power 3535 White LED,its color is available in white, green, blue, red, yellow, Amber according to your need. Tolerance is ± 0.25 mm (.010″) unless otherwise noted. Typical color temperature: 5500-6500 K.
Reading lights (car, bus, aircraft). Traffic signaling/Beacons/ Rail crossing and Wayside. Indoor/Outdoor Commercial and Residential Architectural. Edge_lit signs (Exit, point of sale). 1. θ1/2 is the off-axis angle at which the luminous intensity is half the axial luminous intensity. Customer must apply resistors for protection, otherwise slight voltage shift may cause enormous current change and burn out failure would happen. Do not open moisture proof bag before the products are ready to use. Before opening the package, the Infrareds should be kept at 30℃ or less and 90%RH or less. The Infrared LED should be used within a year. After opening the package, the Infrareds should be kept at 30℃ or less and 70%RH or less. The Infrared LED should be used within 168 hours (7 days) after opening the package. If the moisture absorbent material (silicone gel) has faded away or the Infrareds have exceeded the storage time, baking treatment should be performed using the following conditions. Pre-curing treatment: 60±5℃ for 24 hours. Because the Infrared LED is a high power dissipation device, special and sufficient consideration in thermal management design must be made to optimize the thermal performance. Heat sink design is implemented in the device for an additional thermal connection. Since the device is capable of SMT process, tin must be spread both heat sink and solder pads areas to dissipate the heat. A high thermal conductivity substrate, such as Aluminum or Copper plate etc, must be applied for external thermal management. It is strongly recommended that the outer heat sink or PCB dimension per Infrared LED can not be less than 25 x 25 x 1 (L x W x H) mm. The materials for outer heat sink can be FR4 on Aluminum, MCPCB, or FPC on Aluminum. Special thermal designs are also recommended to take in outer heat sink design, such as FR4 PCB on Aluminum with thermal vias or FPC on Aluminum with thermal conductive adhesive, etc. 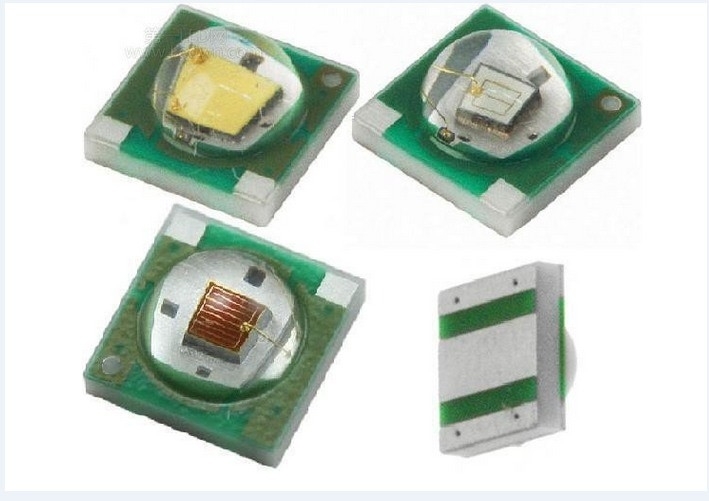 Sufficient thermal management must be conducted, or the die junction temperature will be over the limit under large electronic driving and Infrared LED lifetime will decrease critically. Reflow soldering should not be done more than two times. While soldering, do not put stress on the Infrareds during heating. After soldering, do not warp the circuit board. For prototype builds or small series production runs it is possible to place and solder the LED by hand. Dispensing thermal conductive glue or grease on the substrates and follow its curing spec. Press Infrared housing to closely connect Infrared and substrate. It is recommended to hand solder the leads with a solder tip temperature of 280°C for less than 3 seconds within once in less than the soldering iron capacity 25W. Leave two seconds and more intervals, and do soldering of each terminal. Be careful because the damage of the product is often started at the time of the hand solder. During processing, mechanical stress on the surface should be minimized as much as possible. Sharp objects of all types should not be used to pierce the sealing compound. For other parameters and pictures, please see the attachment PDF files,thank you.